In this ambitious and wildly original debut—part social-political satire, part international mystery—a new virus turns people into something a bit more than human, upending society as we know it. 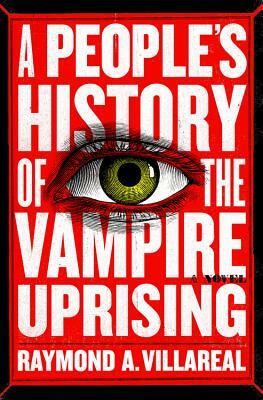 Raymond Villareal was kind enough to answer some questions before he comes to the store to speak about his novel, A People’s History of the Vampire Uprising, on Friday, June 29 at 7PM. I’m in the middle of L.A. Man by Joe Donnelly. I just finished The Gone World by Tom Sweterlitsch and Dark Matter by Blake Crouch. I really enjoyed both books. And I’m about to start How it Happened by Michael Koryta. I LOVED anything by Dr. Seuss and Where the Sidewalk Ends by Shel Silverstein. I love having finished writing something but hate the process of writing. Getting started is the hard part. I’ll do almost anything to not have to start writing. Having finished something even if it’s only a sentence. That is the best feeling. What’s a sentence you’ve loved and remembered from a book? Hmmmm. I’m not sure. I have to write a first draft by hand. Maybe that’s weird nowadays. I also have to listen to music. For this book I would say Bram Stoker, Stephen King, and Anne Rice. I love writing at my desk or in bed. I share a lot of favourite books and writers in common with Raymond.